The Museum of the Earth "Gorge Garden" captures the feeling of a gorge in miniature. Because gorges are, on average, cooler and wetter than the surrounding highland areas, many gorges contain plant species that generally live farther to the north. These are sometimes called "glacial relics" because their distribution was more widespread immediately after the glaciers receded, when climates were cooler. The glacial relics all occur in gorges in Tompkins County, and a few other isolated localities in New York, but they are common in Ontario, Canada. These rare plants are not included in the Gorge Garden, as we cannot adequately provide the conditions they need to survive. Plants were chosen to represent the various micro-climates of a gorge. 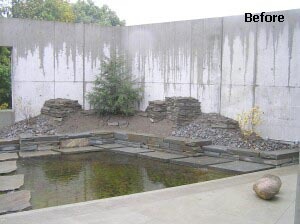 South-facing walls, for example, are generally drier, with sparser cover, and are home to more drought-tolerant plants. 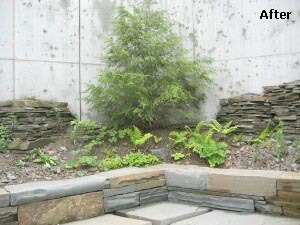 North-facing walls are generally shadier, moister, and cooler and home to more moisture-loving species, such as mosses and ferns. Deeper areas of gorges are generally wetter and cooler than closer to the rim. In larger gorges, the creek edges may receive enough sun to support plants more often seen in wet meadows. Meadow plants were not included in the Gorge Garden, but were planted around the retention basin below the waterfall, and can be seen from the Gorge Garden. With the exception of the three large trees, donated and planted by Cayuga Landscape, all plantings within the gorge garden were donated and planted by members of the Finger Lakes Native Plant Society. The final list of plants was culled from a list of gorge plants compiled by Plantations staff. Most of the plants used were propagated by members from seeds and spores ethically and legally collected from wild sources. Others were divisions of garden purchases. Funds for building the garden were provided by the Ithaca Garden Club and several individuals. All stone work and soil were in place long before the FLNPS got involved! We did the finishing touches with help and guidance from Rick Manning of Northeast Greenways (also a FLNPS member). Not shown in the photos is a small stone “planter” that will link the Gorge Garden pool with the plantings in the retention basin below. It will have a large rush, Juncus effusus, plus a few flowering plants that repeat below.